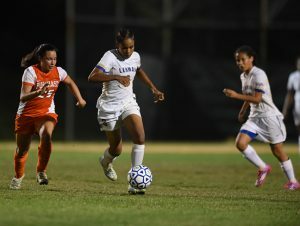 The Lehman College women’s Soccer team suffered a hard-fought loss, 2-1, to the College of Staten Island in overtime in the CUNY Athletic Conference Championship game at Brooklyn College Field on Saturday afternoon. The No. 2-seeded Dolphins, who are now the CUNYAC Champions, have earned an automatic bid into the NCAA Tournament, while the Lightning will wait for a potential bid in the ECAC Metro Championships. The No. 1-seeded Lehman Lightning (14-3) fell behind 1-0, in the 17th minute, thanks to a goal by Danielle Alexandrini. Stephanie Rivera was credited with the assist.